In Archaeology Ireland Summer 2005, I introduced my theory that a number of 9th Century Irish and Scottish artworks represent figures from a hopping dance that must have been widely known at the time. 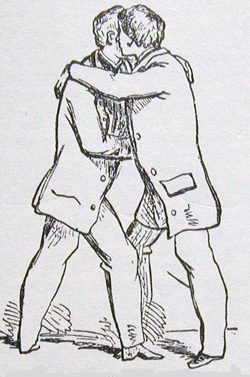 The key to this proposal was the apparent survival of a remnant of this dance amongst the farmers around Abbeystead in the Forest of Bowland, North Lancashire (fig 1). I had begun my study by comparing this dance with a roundel in the Book of Kells (fig2). I remain convinced, after fifteen years of research, that this is the only plausible explanation for the body of evidence that I have assembled. During that time I searched for a context for the dance and had some surprising success. The following article is the background to a presentation that I made at the first International Conference on the History of Freemasonry in Edinburgh, 2007. My 2005 article begged the question “Why would an entertaining men’s dance have been represented in a gospel book and on high crosses in close association with representations of Christ?” To begin to address this puzzle it is clearly necessary to consider the workings of the Irish monastic communities in which these artefacts were produced. By the 9 th Century these communities had been developing for more than 200 years and were large international centres of learning, crafts and industry. The person who, one presumes, had the final say on the choice of biblical iconography for a high cross was the abbot. The choice of decoration would have been left to artists and craftsmen whom we generally assume to be monks. The industry and associated trading would have had a wide international infrastructure. You only have to look at the supply of pigments for making the Book of Kells to recognise how complex this would have been. The artists and craftsmen that made the book had craft skills that had advanced for many generations alongside a developing supply network. The discipline and continuity of a monastic scriptorum would have provided ideal conditions for rapid progress towards the amazing skills demonstrated in the Book of Kells. In a monastic setting the discipline and skills are fostered by the chapter and the hierarchy. In the outside world they are fostered by a variety of organisations with city guilds becoming the most prominent in the middle ages. In both cases there must be a progression from beginner, to worker, to master. In the melting pot of the wider 9 th century Irish monastic community, the boundaries of monastic and secular industry were probably quiet blurred. In the secular world of the middle ages, blood curdling oaths were sworn in secret rituals to protect the mysteries of a craft. If this sort of thing was happening in the 9 th century and the initiate then became a monk, some sort of compromise must have been worked out. We must remember that Christ was the son of a craftsman and probably one Himself. The patterns that had inspired my dance theory were, an illustration in the Book of Kells, a bronze brooch and five stone carvings. I was alert to the possibility that stone masons had an influence on the decoration of high crosses and yet the important positions occupied by some of the dance patterns were hard to rationalize. Back in 1999 I happened to see a TV documentary about Freemasonry in which a new candidate was presented for initiation between two deacons holding wands or rods crossed like an arch in front of him. This reminded me of an illustration in Francoise Henry’s book Irish Art During The Viking Invasions (fig 3). The pattern is on the Market Cross from Kells which also features one of my “dance” patterns. The comparison is by no means conclusive but since the carved pattern has no other satisfactory explanation I thought an investigation into the ritual of Freemasonry might be worthwhile. Many medieval crafts or mysteries had incorporations, guilds or societies that had secret initiation and advancement rituals, the masons were amongst them. Indeed the antiquity and complexity of the mason’s ritual seems to have been exceptional. In Scotland, craft guilds became particularly important and the esoteric nature of the mason’s ritual began to interest outsiders who were allowed to join despite having no working involvement in the craft. The same development occurred in North East England as can be shown by the records of Swalwell lodge. In Freemasons’ lodges in the South of England this transition phase was absent. The first book that I read on the subject was Duncan’s Masonic Ritual and Monitor which has a small illustration of the highest ritual position in Royal Arch Freemasonry known as the Three Times Three (fig 4). I was stunned by this revelation. 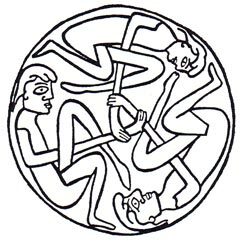 The Book of Kells roundel contains three men in a circle linked by a three-wrist grip and can be interpreted as a dance figure. 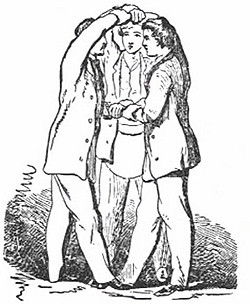 The Three Times Three pose involves three men in a circle linked by two three-wrist grips and there is no explanation that I am aware of, for its importance in Freemasonry. Is it perhaps a symbolic echo of a dance tradition that was important to operative masons but an embarrassment to later non-operative or “speculative” gentlemen Freemasons? Its origins are certainly unknown to the Freemasons of today who deny any involvement with a particular dance. What other mechanism could have brought about this important ritual position? Another series of stone carvings from the same era took me in the same direction. 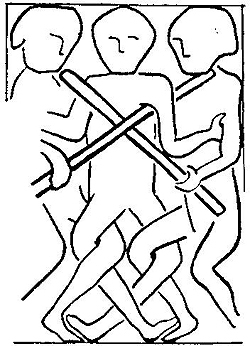 Duncan’s Ritual has another relevant illustration (fig5) which is very reminiscent of a carving on the Durrow Cross (fig6). 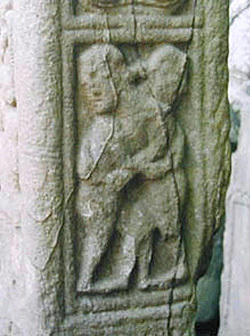 The Durrow carving and others like it have been interpreted as wrestlers in a Back Hold stance as used in Cumberland and Westmorland Wrestling (fig7) and other Celtic or NE Atlantean wrestling traditions. 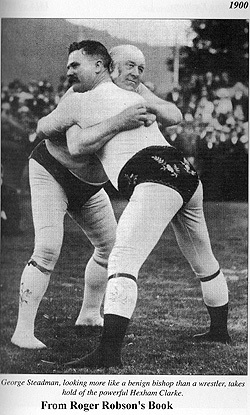 The positions of the men’s arms in the carvings favour a wrestling interpretation but in Freemasons’ Guide and Compendium by Bernard E. Jones, there is a reference to a Freemasons’ “Wrestle Degree”. I believe this piece of ritual has died out and today’s Freemasons would be as surprised as I was to find any Masonic involvement with wrestling. As a result, I am inclined to think that, as the rituals of Freemasonry evolved, the masons adapted a position from a sport that was clearly very popular in the 9 th century. In the words of Roger Robson, champion wrestler, “C & W Wrestling is like a freemasonry, without the secrecy and funny handshakes. New competitors are warmly welcomed and can hardly avoid being helped by wrestlers old and new”. The possibility that working masons were connected with a specific dance is not at all unlikely. In medieval times it was not uncommon for craft guilds to have their own particular dances that were performed as public and VIP entertainments. A good example was the sword dance of the Glovers and Skinners of Perth. It was performed before the king in 1617. Judging by a contemporary description it was an example of the Pan-European Hilt and Point Longsword dance genus that I introduced in my last article. On Tyneside in Northern England a variant of this type of dance developed that is known as Rapper Dancing. Rapper Sword Dance is performed by five men whereas the more widespread Longsword Dances usually have six dancers. The rapper “swords” used are short flexible bands of spring steel with handles at both ends. Rapper Dance was associated with coal miners and from its origins in the late 1700s or early 1800s it developed alongside early Freemasonry in villages like Swalwell and its neighbour Winlaton. Tyneside villages had annual fair days called Hoppings. A song titled “Winlaton Hopping” composed around 1830 specifically mentions sword dancing taking place. The Winlaton dance of the 1920s can be seen by searching for miners’ dances on the British Pathe web page. Cecil Sharp noted the dance in 1912 and published it in “The Sword Dances of Northern England” along with sword dances from other villages. The Winlaton dance has a spin figure that does not occur in other traditions. The five dancers form their swords into a star lock then, facing into a circle, holding the handles of their swords and bracing their elbows they step round at high speed. I was a Rapper Dancer for 6 years in the late 1970s and was familiar with the spin. When I stood in the Freemasons’ Three Times Three position I was immediately reminded of the spin figure. The wrist grips are ideal for resisting the centrifugal forces of a fast spin and the specified foot positions are exactly those used in the dance figure. This realization was fantastic. It meant that the Freemasons had preserved another figure that could be part of my three-man dance. To confirm my theory I visited Monkseaton Rapper Dancers on a practice night and asked three of them to stand in the Three Times Three position. When I asked what it suggested to them they all replied “the start position for a spin”. I pointed out to them that down the road in the local Freemasons’ lodge it meant something else entirely. I have come to the conclusion that Rapper Sword Dance evolved out of an older Longsword tradition with some input from the mason’s hopping dance and crucially, the local availability of a much improved spring steel. 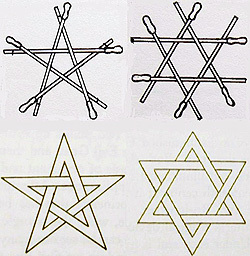 Freemasons love their symbolism but the “coincidence” shown in fig(8) suggests that two of their important symbols are more like illustrations. The most concentrated area of Longsword dancing traditions in Europe is Yorkshire and English Freemasons have, in the past, regarded York as the home and origin of ancient masonry so despite the lack of documentary evidence a link between sword dance and freemasonry seems likely. (from Longsword Dances by Ivor Allsop). A JAK Cartoon from the London Evening Standard showing a miss-understood or spoof Masonic handshake (courtesy of Patrick Jackson). Why is this relevant to Irish Archaeology? If the hopping dance that was represented in Ireland and Scotland around the 9th century was done by a school of craftsmen, then this was one thread of culture that developed into the worldwide Freemasonry of today. The seeds of the movement would have been planted around the continent by the Irish monastic network long before the Crusades and the Templars. Tyneside was converted to Christianity by monks from Iona so the seeds of the movement, including the hopping dance, would have been firmly planted in NE England as part of the package. In NW England there is an 8 th century connection to Ireland via the probable monastic site around St.Patrick’s Chapel at Heysham. This could have allowed the seeds to reach Wyresdale (17 Km away) in the first millennium but there may be a later connection via Furness Abbey in the 12 th century. Furness Abbey on the west side of Morecambe Bay was originally founded by Savigniac monks from Normandy/Brittany. They set up an offshoot in Wyresdale on the east of the bay for a brief time hence the name of the hamlet of Abbeystead where the hopping dance was a tradition. The Savigniacs had a spiritually parallel brotherhood called the Tironensians, also from France, who built many abbeys in Scotland including Kilwinning. They appear to have practised the Celtic Rite and consequently they were able to integrate with residual Columban/Culdee groups. If you study Scottish Freemasonry, you quickly realise that there is something very special about the Freemasons’ lodge at Kilwinning in Ayrshire. It is called The Mother Lodge No.0 and it is claimed to have been founded in 1140 CE during the building of Kilwinning Abbey. When the Tironensian monks arrived to build the abbey on the site of an earlier Irish monastic foundation there were still a few Columban/ Culdee monks living there so, once again, there is a connection to the Irish monks of Iona and Kells who knew the hopping dance. Whether the Masonic legacy was maintained by the Tironensians, the Culdees or both is unclear. Another piece of this jigsaw fell into place when a friend reminded me of the widely known spoof Masonic handshake that once featured in a Monty Python sketch in the 1970s. The cartoonist Raymond Jackson or JAK of the London Evening Standard also pointed out that it was a non-starter as a secret handshake (fig9) however it isn’t hard to imagine a confused conversation along the lines of “The Freemasons.....oh! They are the chaps with secret handshakes and a dance where they do this” (gripping hand and putting leg over arm). This mention of comedy is wholly relevant. If you look at a reconstruction of the dance on youtube.com (by searching “3 kick, wyresdale”) you will hear a lot of laughter from the audience. 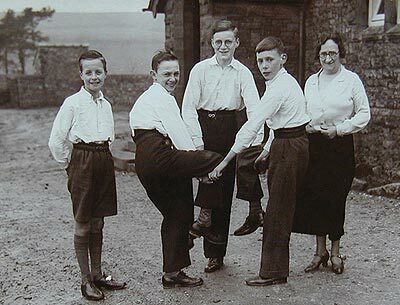 This is initiated when the dancers start an arse-kicking sequence (in Wyresdale the hopping dance was simply known as “Greensleeves” and in a local fiddler’s tune book from 1789 the tune Greensleeves is also titled “kick my A—E”). I have found this the hardest part of my investigation because comedy is so ephemeral and difficult to deal with in an ancient historical context. This repeated kicking chorus may have had a separate history. It occurs in the Ilmington Buffoon Cotswold Morris Dance and it seems to be related to Pimponpet which is listed as one of Gargantua’s Games by Rabelais (c.1494-1553). In Randle Cotgraves English/French Dictionary published 1611 it is described as “A kind of game wherein three hit each other on the bumme with one of their feet”. In 1653, Thomas Urquhart, translator of Rabelais, seems to have been familiar with Pimponpet and translates it as Bumdockdousse. I still haven’t answered my question at the start of this article, ”Why would a curious hopping dance be represented beneath the figure of Christ”? I believe that in the latter half of the first millennium a brotherhood of craftsmen were present in Ireland and revered this dance for its antiquity and its association with a ritual tradition from the Near East. Where did Christianity come from?... The Near East. Where does Freemasonry claim to come from? ...The Near East. I have found ancient dance evidence from Mesopotamia even back to Babel but it will have to wait for my next article. This theory of mine is never likely to get full academic credence. I am only an unqualified amateur historian, but the evidence is so strong and multi-disciplinary that I believe my interpretation is probably correct. The hopping dance is a key that can unlock a number of mysteries. Once again I leave readers to judge for themselves.